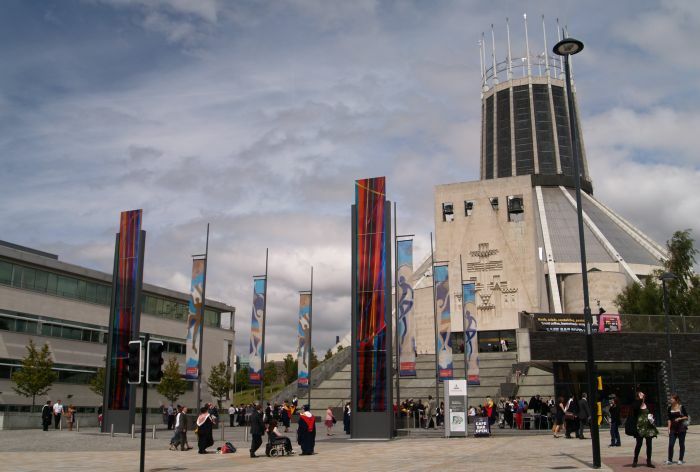 Liverpool RC Cathedral: The Catholic Cathedral is situated at the north end of Hope Street where it meets Mount Pleasant. 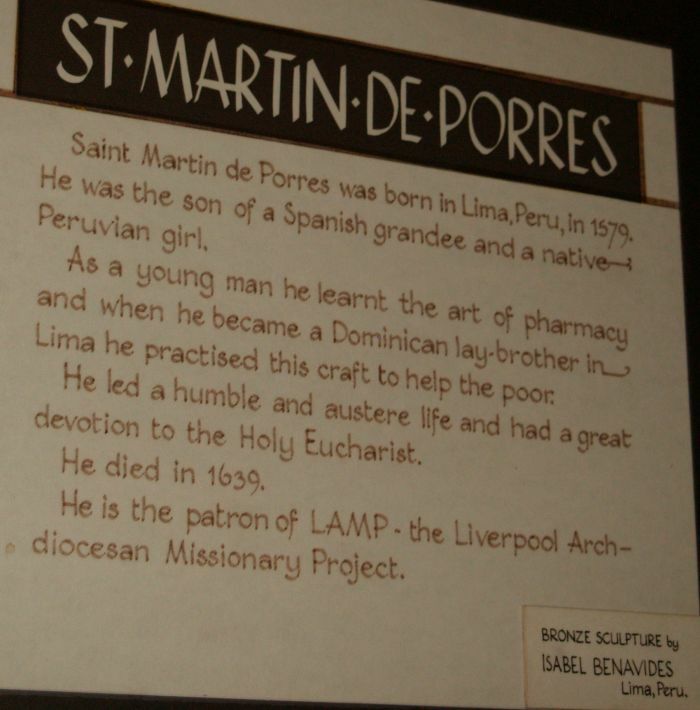 Liverpool became a Catholic Diocese in 1850 and a cathedral was started in Everton in 1853, but never came to fruition. 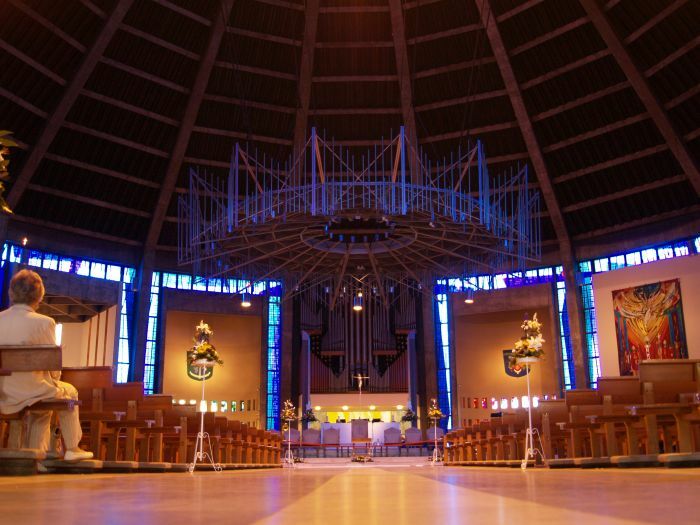 In the 1930, with Liverpool's population swelled by thousands of Irish-Catholics, it was proposed to build a cathedral in a scale and style never seen in Britain before. 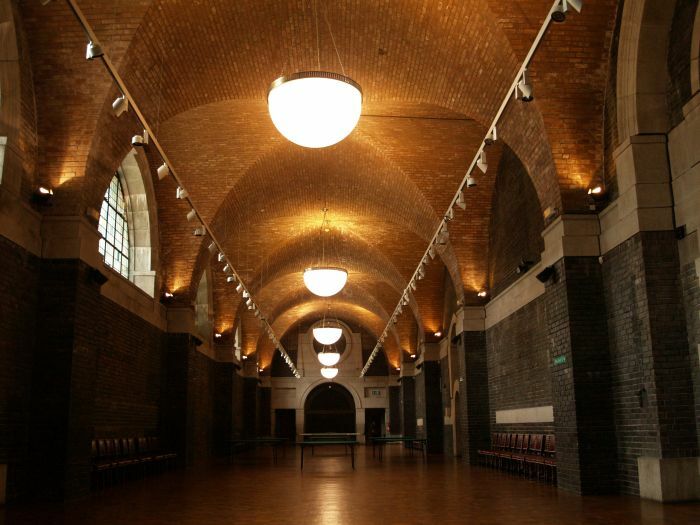 Sir Edward Lutyens was commissioned and the design exhibited in the Royal Academy London in 1932. 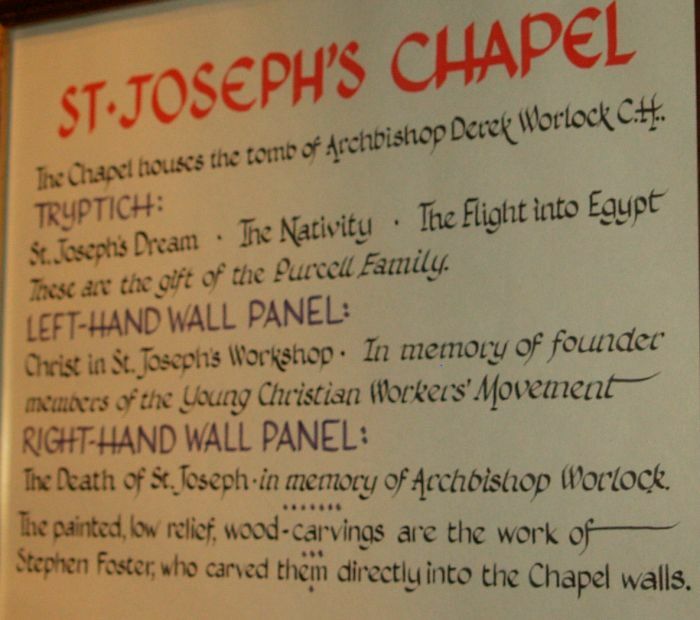 However with lack of funds, only the great Crypt was completed by 1958. 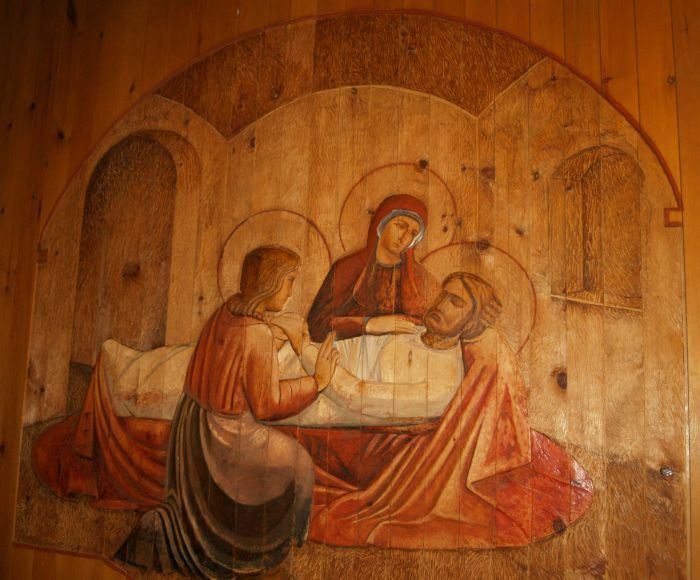 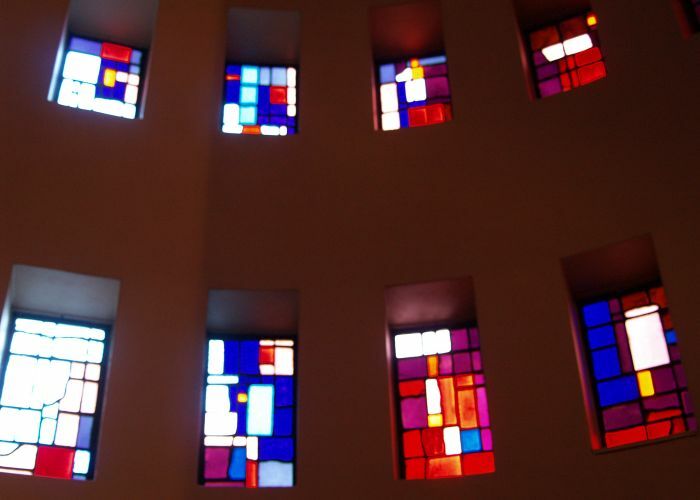 In the 1960 a world wide competition was launched for a new design more in keeping with the new spirit of the Liturgy then being formulated by the second Vatican Council. 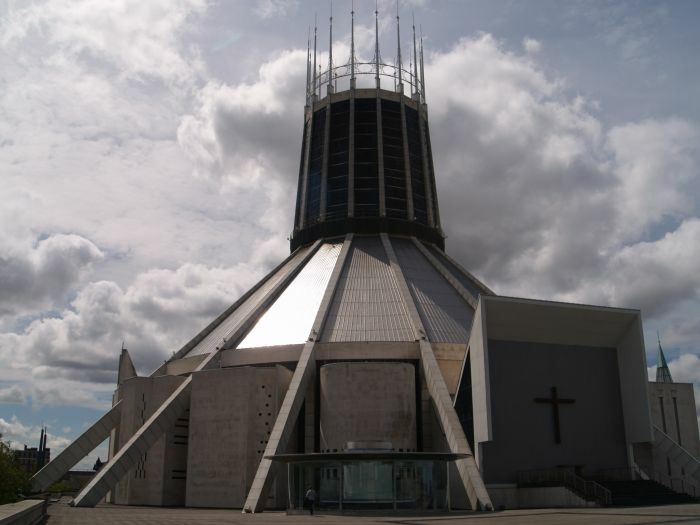 The architect Frederick Gibberd's design was chosen and building began in 1962 and the finished cathedral was consecrated on May 14th 1967. 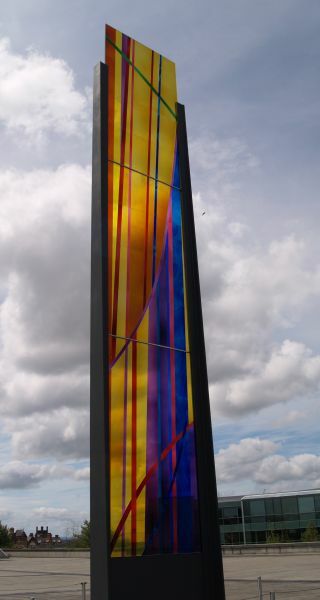 The approach to the Cathedral entrance from Mount Pleasant. 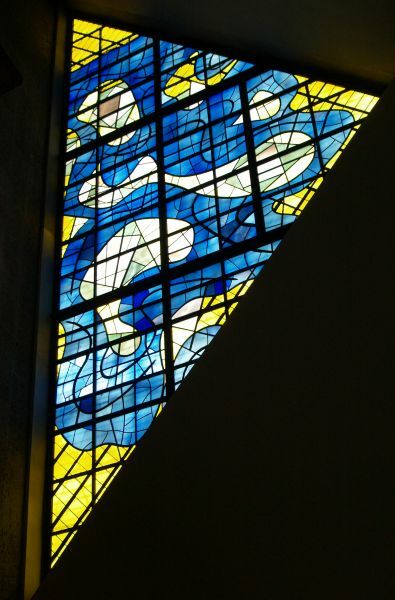 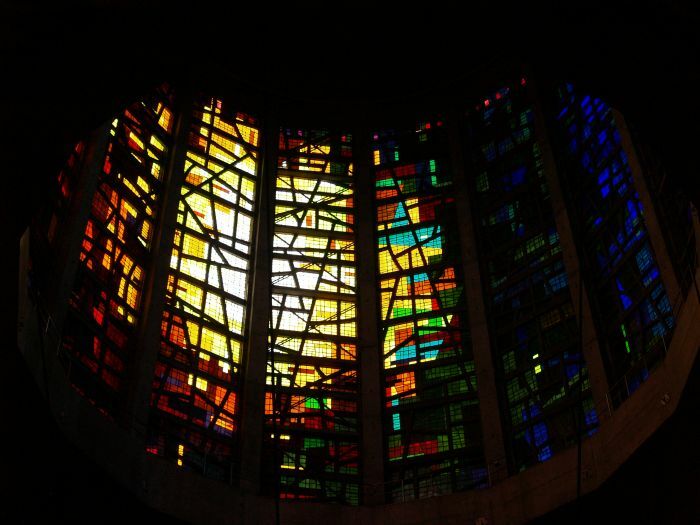 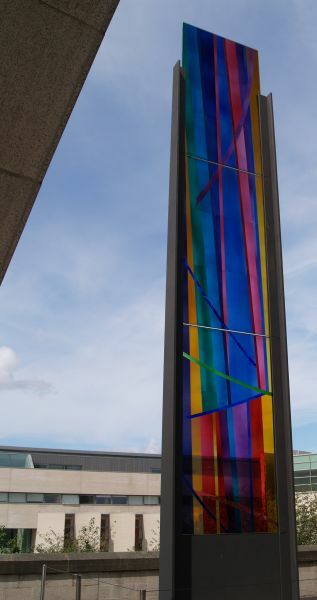 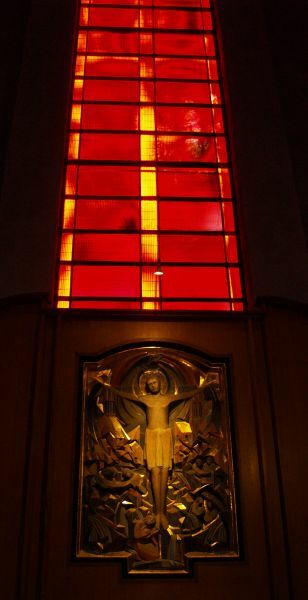 Two of the tall stained glass panels are in the foreground. 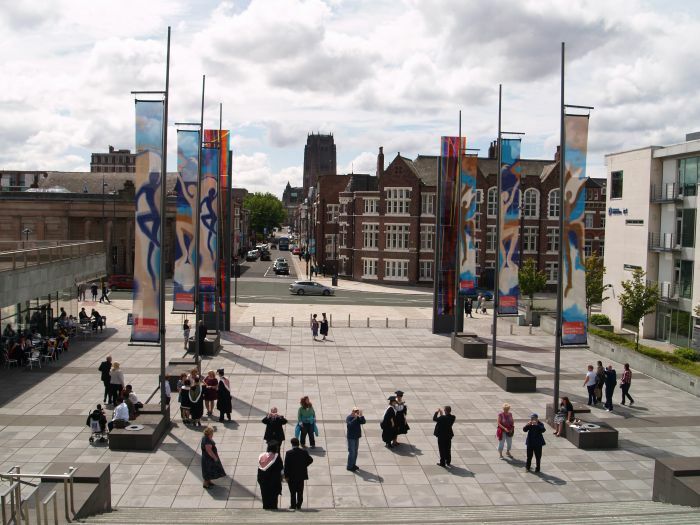 You can also see the Cathedral was being used for one of the graduation days of the universities. 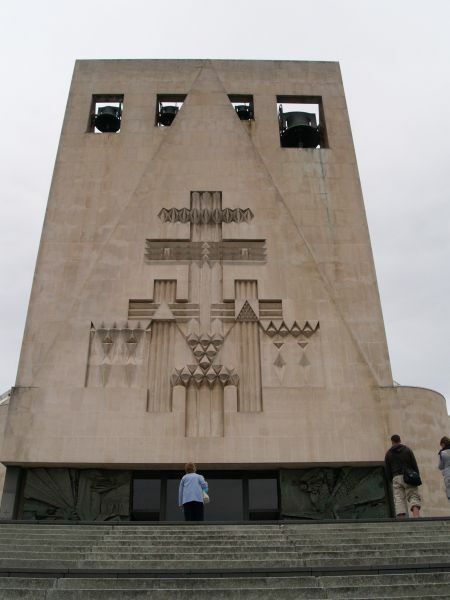 Liverpool RC Cathedral: The concrete sculptures and campanile above the entrance. 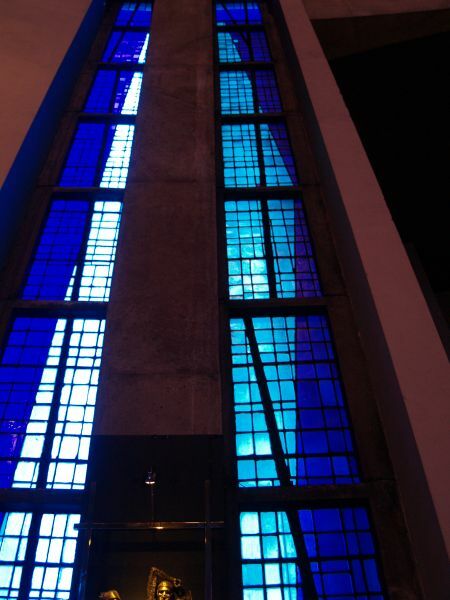 Liverpool RC Cathedral: More of the tall stained glass window panels at the rear' of the cathedral. 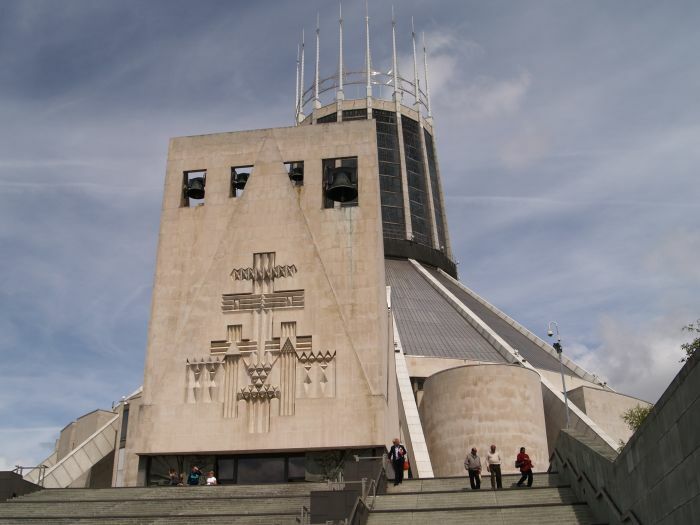 Liverpool RC Cathedral: The full pyramidal-circular nature of the Cathedral structure is best appreciated on the Brownlow Hill side of it. 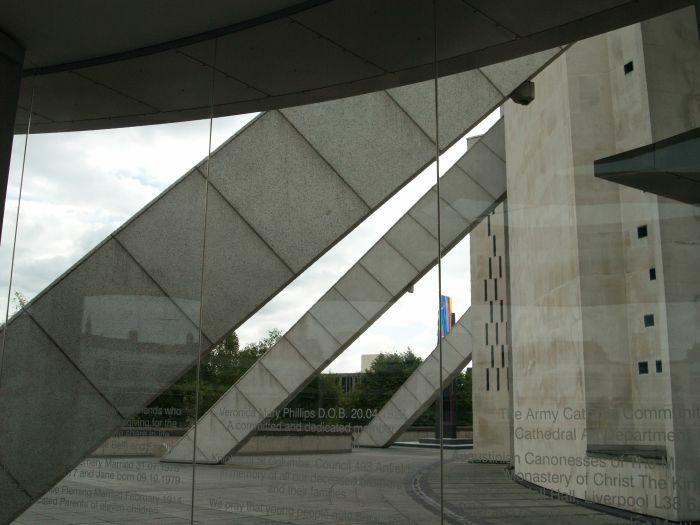 Liverpool RC Cathedral: The angled 'buttresses' supporting the main structure. 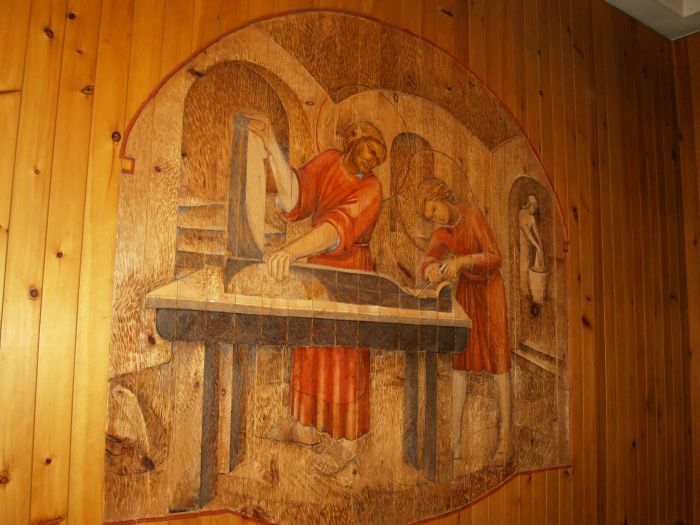 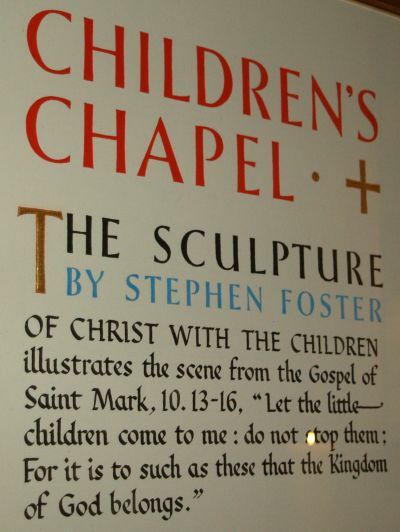 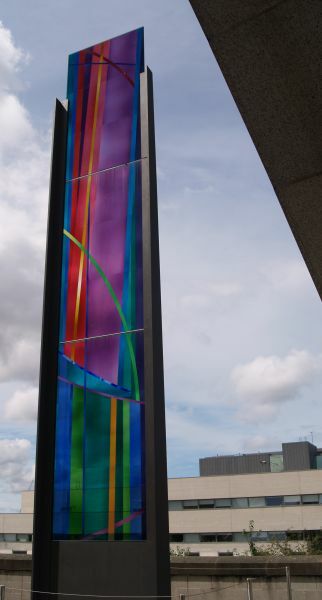 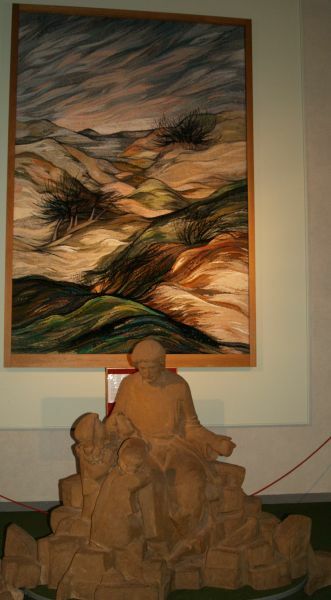 Liverpool RC Cathedral: On the Cathedral walls are embroidered hangings designed and made in the Cathedral Art Studio. 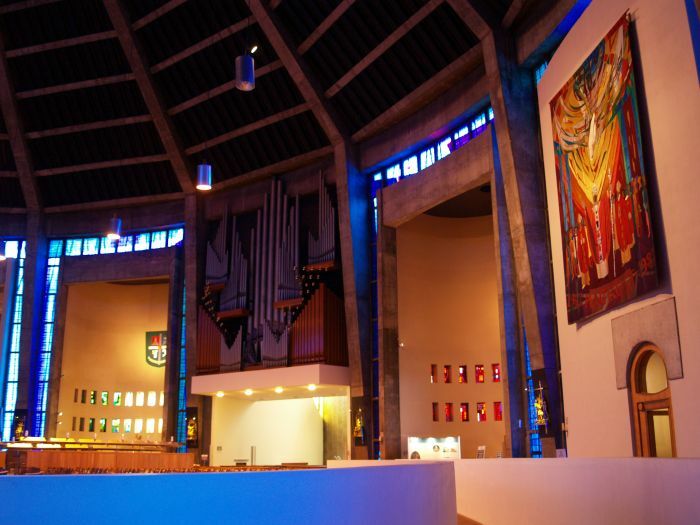 Liverpool RC Cathedral: View from the entrance foyer to the Sanctuary and High Altar. 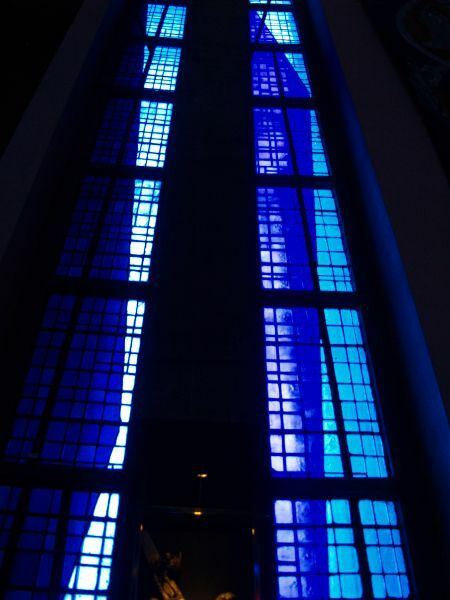 Liverpool RC Cathedral: Some of the blue-cyan coloured stained glass windows. 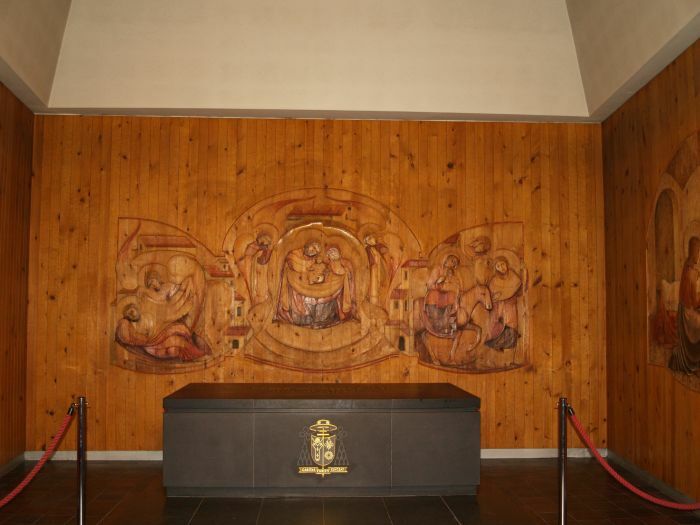 Liverpool RC Cathedral: The beautifully carved and 'lightly' painted wooden panels and stone altar in St Joseph's Chapel. 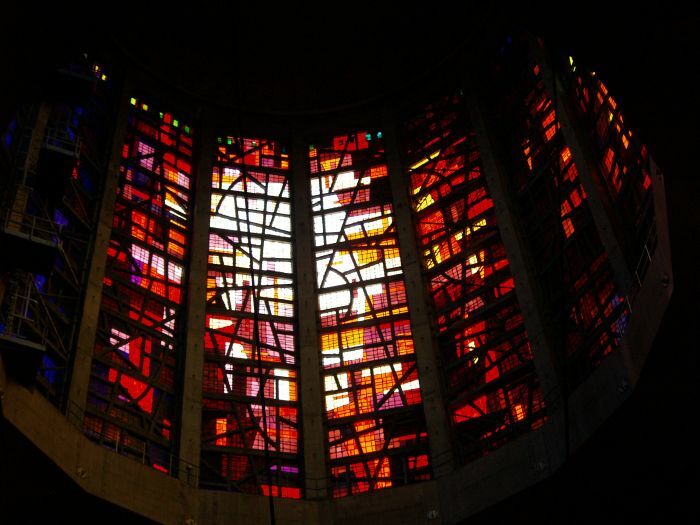 Liverpool RC Cathedral: Some of the smaller stained glass windows. 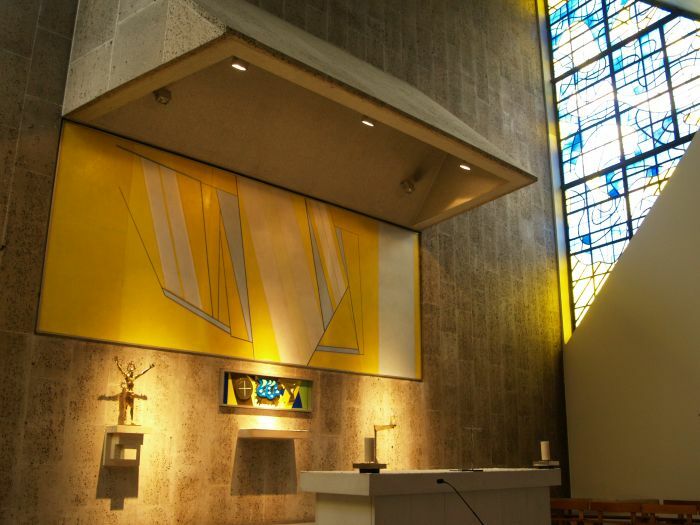 Liverpool RC Cathedral: Chapel of Reconciliation ? 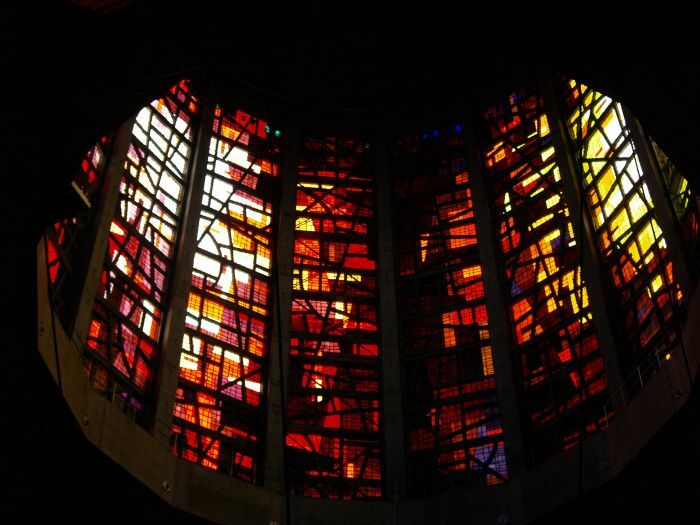 Liverpool RC Cathedral: The stained glass window panels of the lantern - effectively the 'dome' of the cathedral. 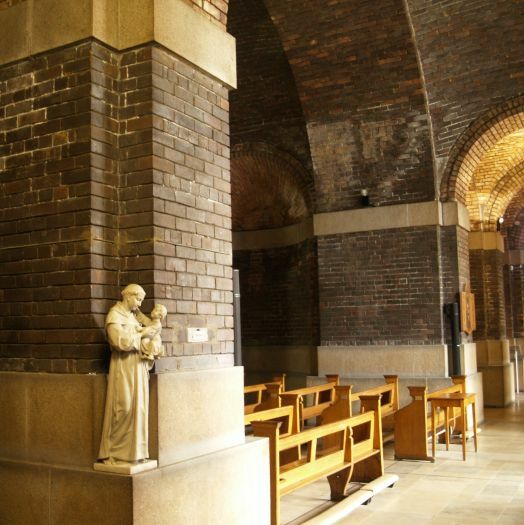 Liverpool RC Cathedral - Lutyens Crypt: The Crypt is effectively the crypt of the Sir Edwin Lutyens (a much renowned architect) cathedral that was never built in the 1930s. 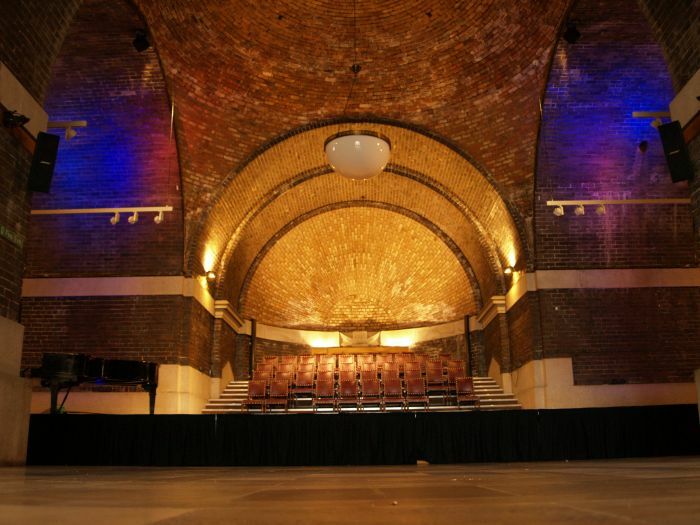 The Crypt was built between 1933 and 1958 and is a massive vaulted brick construction. 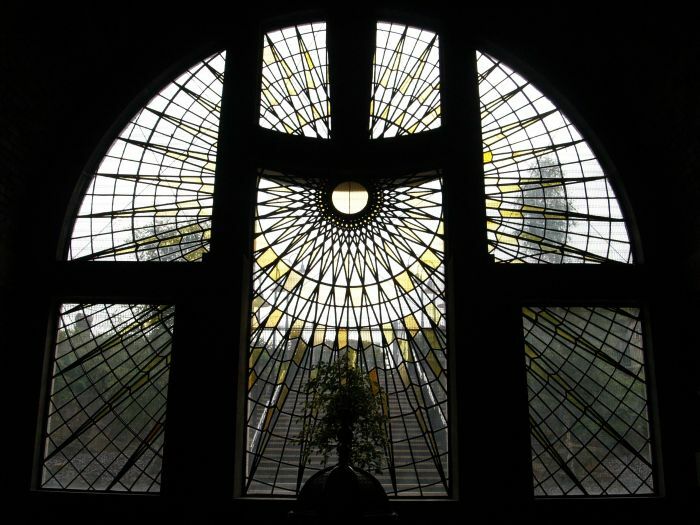 Above is a view of the Crypt Hall. 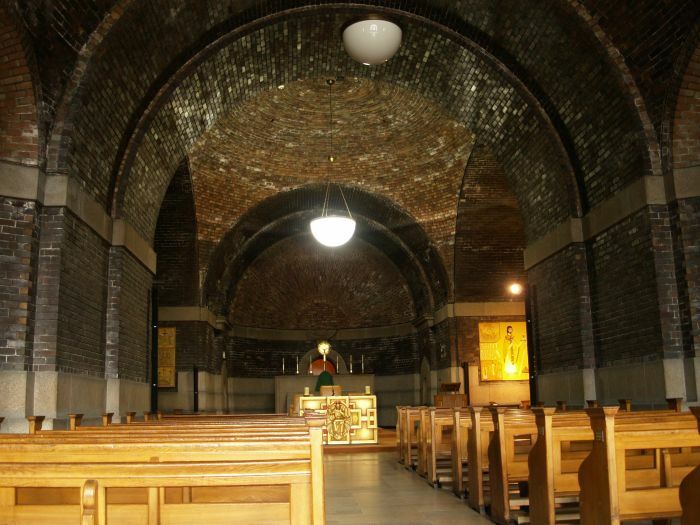 Liverpool RC Cathedral - Lutyens Crypt: It is one of the biggest crypts in the world. 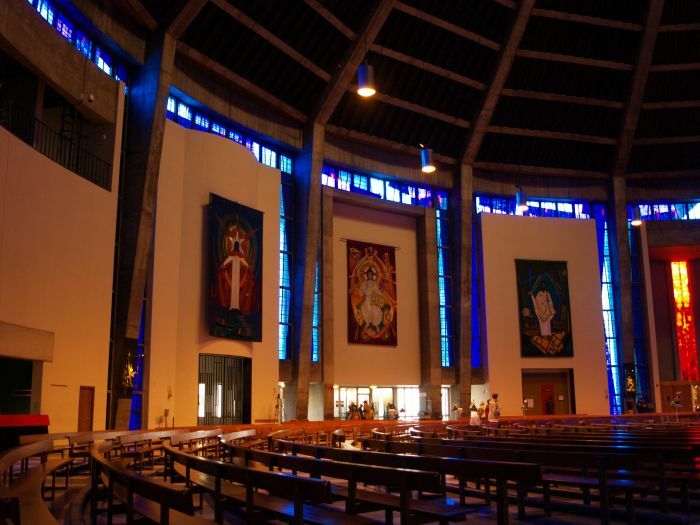 Liverpool RC Cathedral - Lutyens Crypt: There are four large spaces and each can hold between 300 and 700 people! 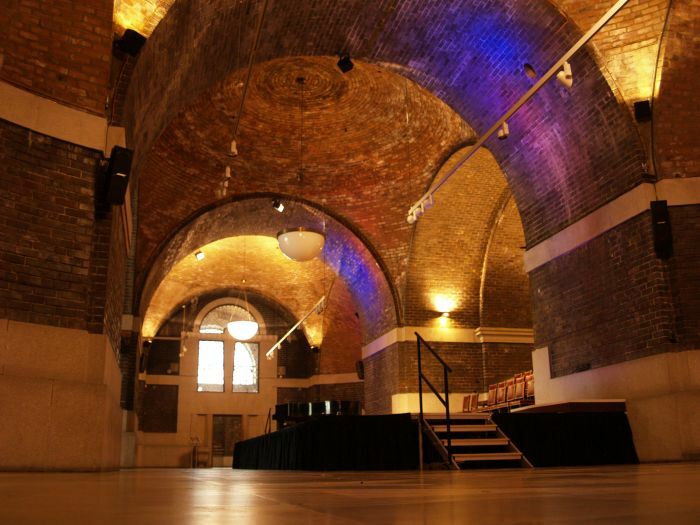 Liverpool RC Cathedral - Lutyens Crypt: One of the halls is used as a concert room. 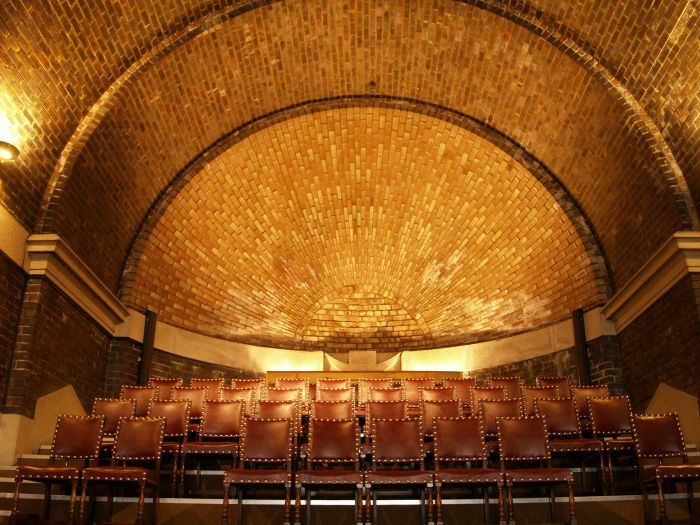 Liverpool RC Cathedral - Lutyens Crypt: Wonderful radial brickwork of the concert room. 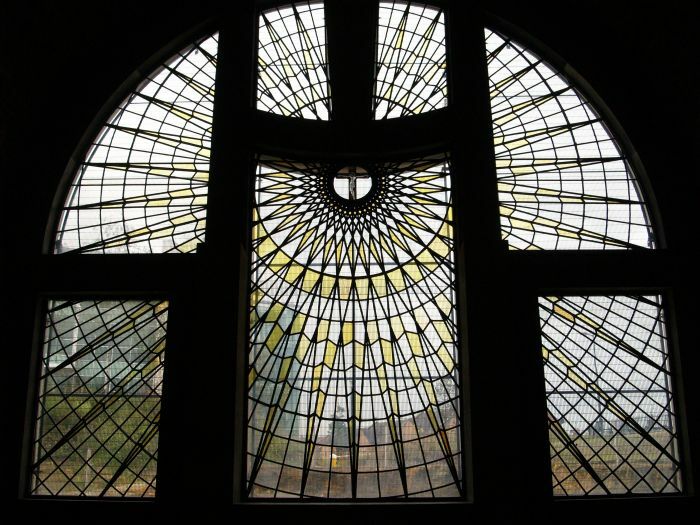 Liverpool RC Cathedral - Lutyens Crypt: The two great windows of the Crypt with a small amount of stained glass. 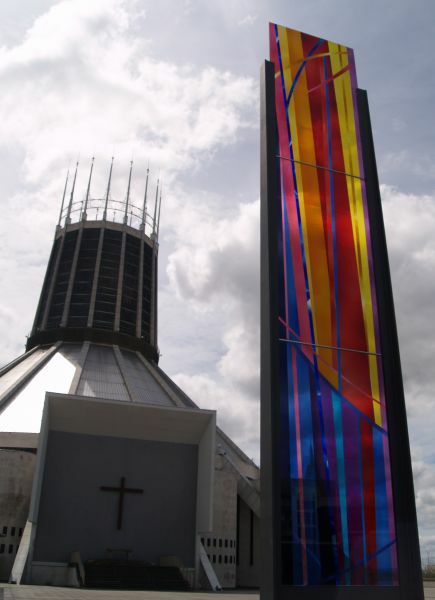 Looking from Liverpool RC Cathedral to the great square tower of the Anglican Cathedral at the other end of Hope Street.